Clean Air in London (CAL) sent the Mayor of London a Letter before Action on 3 December 2010 about a proposed claim for Judicial Review of the Mayor’s decision on 3 October 2010 to remove the western extension of the congestion charging zone (WEZ). In that letter, the Mayor was requested to agree to ensure that annual mean and peak concentrations of nitrogen dioxide (NO2) and other Air Quality Directive pollutants in ambient air throughout the WEZ area will not exceed those in 2010 following the removal of the WEZ. In response, the Mayor and Transport for London (TfL) – acting for the Mayor – have provided new assurances to CAL that offsetting measures will be introduced to ensure not only that there is no worsening of air quality within the WEZ, but that air quality is actually improved relative to 2010. These assurances are surprising because the Mayor and TfL have both previously said removing the WEZ would increase air pollution in west London and they have never quantified the cumulative impact of mitigation measures (Notes 1 and 2). On the above basis, CAL has instructed Harrison Grant Solicitors to accept the assurances and decided not to proceed with a judicial challenge to the Mayor’s decision to remove the WEZ. See also Note 1 for further details of the assurances received. The Mayor’s public commitment to reduce emissions in the WEZ area, and the statements in TfL’s letter to CAL’s solicitors, give rise to a ‘substantive legitimate expectation’ that offsetting measures will be introduced to ensure not only that is there no worsening of air quality within the WEZ area, but that air quality is actually improved relative to 2010 (see Note 3). Note: The Harrison Grant letters dated 3 December 2010 and 14 January 2011 are available from CAL’s website. CAL has no objection to TfL publishing its letter to CAL dated 17 December 2010. 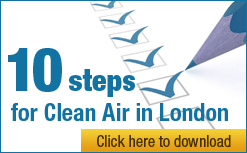 “Clean Air in London (CAL) welcomes the promise from the Mayor of London that he will deliver compensatory measures which will ensure cleaner air for west London despite the removal of the western extension of the congestion charging zone (WEZ). It is very disappointing though to have had to fight for more than two and a half years to win a commitment to measures to offset backward steps on air quality. “The Mayor’s public commitment to reduce emissions in the WEZ area, and the statements in Transport for London’s letter to CAL’s solicitors, give rise to a ‘substantive legitimate expectation’ that offsetting measures will be introduced to ensure not only that there is no worsening of air quality within the WEZ area, but that air quality is actually improved relative to 2010. “This case has shown that the Mayor cannot pursue seemingly populist policies unless he: complies fully with his statutory responsibilities including those to protect public health; and ensures that gains in one part of London are not achieved at the expense of another. To run a great city likes ours, the Mayor must be able to ‘walk and chew gum at the same time’. “CAL will be closely monitoring the relevant air pollutants at the three automatic monitoring stations within the WEZ area on the excellent London Air Quality Network i.e. Brompton Road, Cromwell Road and King’s Road (see Note 4). CAL expects that action will be taken swiftly should the proposed measures fail to achieve the promised ‘more than offsetting’ effect on air pollution in the WEZ area and beyond. “In that context it was surprising to see ‘Bad Air Day (B.A.D.) 2011 for toxic gas’ as the nitrogen dioxide (NO2) hourly limit value was first breached in London for the whole of 2011 within a week in Brompton Road (and Putney High Street). The breach in Brompton Road, in even less time than last year, suggests – at this earliest of stages – the Mayor may have some thinking to do to deliver on his assurances (see Note 5). “In a separate but related development, it is disturbing the Government is threatening to remove its only monitoring station in the WEZ area, situated in Cromwell Road, from its national network during 2011. Note: Details of the Government’s intentions were obtained under the Freedom of Information Act and are available on the CAL website. ii. “The assessment of the removal of Western Extension Zone (WEZ) anticipates a small increase in emissions which is not expected to result in a significant impact on air quality concentrations. That assessment did not however consider the offsetting benefits of the measures set out in my Air Quality Strategy. The Strategy provides a wide range of measures which are targeted to improve air quality across London, including within the WEZ, through reducing emissions of NOx and PM10. Tightening standards and bringing larger vans and minibuses into scope for the Low Emission Zone scheme, reducing emissions from the bus fleet, introducing taxi and private hire vehicle age limits, and tackling idling emissions from parked vehicles such as taxis and coaches will all assist. In the unlikely event of a discernible worsening of air quality in the WEZ area, we would implement targeted local measures, in the same way as in other localised parts of central London if such problems were to arise.” CAL emphasis. Note: Emissions need to be reduced by about 10% to achieve a 5% reduction in concentrations. There are three automated air quality monitoring stations in the WEZ area. These are in Brompton Road, Cromwell Road and King’s Road (in the Royal Borough of Kensington and Chelsea).